Dance institutions can extend our sense of time, something that’s rare in an overwhelmingly immediate art form. In performances I saw last summer at Saratoga and Jacob’s Pillow, the 150-year-old continuity of the New York City Ballet was on view. When contemporary ballet is a collection of ballet-like gestures smooshed together with other dancey and non-dancey things, these three evenings of ballet showed how diverse the real thing can be, and how long lasting. City Ballet has called Saratoga Performing Arts Center its summer home since the Center opened fifty years ago. 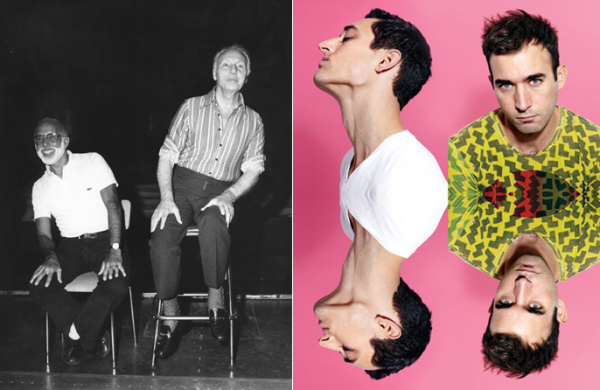 This year the NYCB’s two-week residency featured works by its anchors George Balanchine and Jerome Robbins, its current artistic director Peter Martins, and the young choreographers Christopher Wheeldon, Alexei Ratmansky and Justin Peck. On two programs in July, I was able to see Martins’ revival of the 1836 Bournonville classic La Sylphide, alongside the 1977 Bournonville Divertissements by Stanley Williams; and on a second program the Balanchine classics The Four Temperaments (1946) and Symphony in C (1948), together with Martins’ Symphonic Dances (1994). 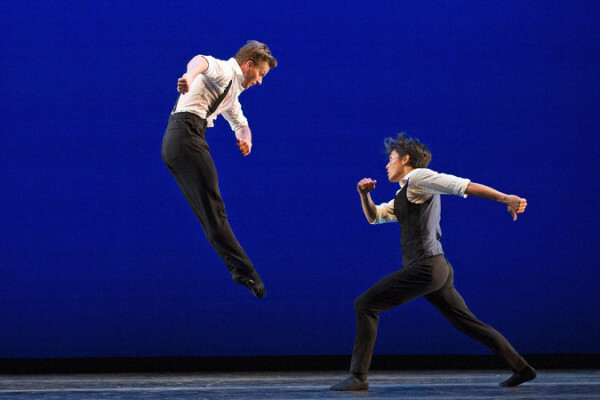 At the end of the month at Jacob’s Pillow, NYCB principal dancer Daniel Ulbricht and his “Stars of American Ballet” showed a program by Robbins, Peck, Wheeldon and the Danish dancer-choreographer Johan Kobborg. It seemed to me that all the ballets on the three programs were connected, not just because they shared classical ballet technique. La Sylphide is one of the oldest story ballets in continuous repertory. Like all old ballets, it gets spiffed up periodically, with new costumes and décors and rearrangements of dance designs. The steps remain much the same, but dancers’ understanding of those steps changes slightly and slowly over time. No one alive knows exactly what the Royal Danish Ballet dancers looked like in Bournonville’s time, but Peter Martins grew up in that company. Bournonville is in his blood. When he immigrated as a principal dancer to the NYCB in 1970, he looked restrained yet impeccably classical, a different animal from the other dancers in that company. I don’t know if I ever saw him dancing James in La Sylphide, but I can visualize him in the role. His new production of the ballet looks authentic except for the scenic elements—electric green and purple tartans, flouncy women’s skirts, Disney-esque forest backdrops. Martins has commented that combining the first and second acts to eliminate the intermission is the only change he made. But I noticed a couple of other differences from other productions. The mime passages that explain the characters’ behavior seem to have been cut or abridged. When the ragged crone Madge is discovered hiding in the corner, James wants her thrown out, but the others persuade her to read the palms of the wedding guests. Before she gets to predicting that Effie will marry Gurn instead of James, she usually tells the fortunes of a few other girls. I didn’t see this. When James has followed the Sylphide into the woods, she brings him treasures; the bird’s nest that’s usually one of them isn’t there. I even missed the Sylphide’s classic pose leaning on the window frame, immortalized in lithographs of Marie Taglioni, the original Sylphide, and replicated in countless stage productions. Martins has cast a child in the scene in which Madge is brewing a vat of poison. She’s planning to drench a scarf in it and give it to James on the pretext that it will win the Sylph for him. In fact, it will kill her and gain Madge revenge for James’s rude treatment. Madge sometimes has witchy accomplices at this conjuring. When one of them is a child, a macabre humor can infect the scene of foreboding and magic. But American audiences understand children on the ballet stage as a special attraction, not as ordinary citizens, and the effect was to make a bit of a cartoon of the whole magic-brewing scene. Martins did include seven children in the charming Scottish reel that precedes Effie and James’s foiled wedding. Martins’ Sylphide seemed reduced to me, or distilled. It’s romantic for an audience that doesn’t get Romanticism. When we say romantic now we mean the desired outcome of a dating service meetup, not something sinister and supernatural, which is at the heart of nineteenth-century Romanticism. The Danish critic Erik Aschengreen’s program essay, “The Beautiful Danger,” sent me back to his 1974 volume of Dance Perspectives. There, Aschengreen expands on the dualities in the Romantic era, the conflict between harmony and the forces that destroy it, especially eroticism. James is an interesting character because he has to resolve this conflict. But the Sylphide is also endangered. Sensuality —her love for James requires giving up her life as a spirit—brings about her downfall as well as his. New York City Ballet posted a trailer for La Sylphide on YouTube. A sleeping man’s face is seen in shadowy closeup (Andrew Veyette). He wakes suddenly; a woman is in the room, her long hair blowing in the wind (Sterling Hyltin). She disappears, and he rushes to the window, pushing aside the curtains to look for her. The camera scans the room: a desk, a mirror. A door slams shut: the closet? He rifles through the clothes, pushes through the back of the closet, then, with explosive force and a blackout, he’s lying on the ground outside. He gets up and heads toward some bare woods at the edge of the field, tentatively at first, then breaking into a run. The short film was produced by former NYCB dancer Ellen Bar and Rebekka Bjornsdottir and directed by Yoonha Park. Bar was a director of the video based on Jerome Robbins’ New York Export: Opus Jazz a few years ago, and Park directed another trailer video for Justin Peck (Year of the Rabbit, 2012). At the Bournonville Festival in Copenhagen in 2005, there was an exhibit of photographs of the RDB dancers in scenes of decadent escapades suggested by RDB ballets; they were the basis for a calendar that quickly sold out. All these films and images are about “real” fantasies and take place in ordinary settings: a beach, a parking lot, a dance studio, a clearing in the woods. They’re not the same as ballet fantasies. Dance Magazine has noted with approval that the La Sylphide trailer is part of an NYCB campaign to attract young audiences. Maybe it’s the desire—the cultural license—to act out fantasy in the real world that makes ballet fantasies seem dated and that leads the ballet audience to glorify physical transcendence instead. Bournonville Divertissements is more like a Balanchinian creation, though it’s made up of dance segments from Bournonville’s story ballets. Like most nineteenth-century ballets, Bournonville’s works wove spectacular dancing into stories. His interpolated showpieces sometimes took on aspects of the story surrounding them, and the dancing was often inflected with the folk dances the choreographer saw on his travels. The Tarantella from the last act of Napoli is an example. Within the story of the ballet it’s part of a conventional last-act marriage celebration and is preceded by a classical variation for the ballet’s principals and their friends. Then they’re joined by other townspeople for the Tarantella, to Holger Simon Paulli’s infectious music. Instead of showstopping virtuosity, the dance releases a continuous stream of fast, swirling footwork and partner-switching. Nilas Martins staged four of the original Bournonville Divertissements for the 2015 season, and I came away with the same elation that over­took me at the three Bournonville festivals I attended in Copenhagen (1979, 1992 and 2005). This dancing is effervescent. It’s not just the abundant jumping that makes the dancers look so lively. Bournonville has a different relationship to music from most other ballet we’re used to. Most of the time, the dancer is already in the air on the downbeat of the music, while in other classical choreography the dancer uses the downbeat to propel himself or herself off the ground and gets into the air a moment after that. The difference is miniscule, maybe even unconscious, but I think the sense of skimming or floating above the ground is at the heart of Bournonville style. In Western music the downbeat is the organizing element of a composition’s timing. It provides a momentary consolidation, bringing the musical line back to a sort of home base. In Bournonville, the dancer doesn’t seem to touch base between flights. Jumpers often travel while in the air, extending their trajectory with constant changes of the head, shoulders, upper torso, and the direction of the step. Bournonville dancers never seem locked into a stable verticality. Even standing still, their heads tilt or turn away from front, one shoulder seems about to pull them to the side. In the more grounded, folk-dance-derived pieces, like Napoli’s Tarantella, the dancing may slow down as the characters spell one another, but the dance doesn’t stop for individual applause. The NYCB dancers managed this departure from their customary style quite well, though there was some uncertainty about the timing in the unison sections at the end of the Tarantella. I missed some of the detail that makes Bournonville so interesting despite its reticence: the small changements of the feet on 16th notes, the distinction between large and small jumps, the foot decorations in the air, the foot that slides into a closing fifth position. This explicitness of step vocabulary possibly evolved because the Royal Theater in Copenhagen is small and intimate enough to afford the audience a close view of the stage. The SPAC theater, a shed with vast outdoor lawn seating, can accommodate 25,000 persons. Even inside the shed, the visibility isn’t close. The Stanley Williams distillation of Bournonville dances included excerpts from Flower Festival in Genzano and Abdallah as well as Napoli. They all carried some flavor from the original stories. In some ways, Balanchine’s plotless ballets too may be drawn from the essence of ballet stories past, but without the stories. His first ballet in America, Serenade (1934), is like a string of memories from his European past. In 1952 he even did a formal gloss on La Sylphide, Scotch Symphony. These plotless works could be called abstract, but ballet is never entirely abstract. Rather than scooping out the dancey bits from previous ballets, Balanchine made dance the main subject. I think his choreographic process must have involved working with a lexicon of what people do—courtly behaviors, arrivals and departures, imitation and contradiction—alongside the classroom steps. The steps are mostly without character, but the actions have real life built into them. Symphony in C can be thought of as simply a physical illustration of Georges Bizet’s music, its varying tempi and recurring thematic material calling up dancerly parallels. In a more contemporary mode but no less classical, The Four Temperaments reflects the tight structuring of Paul Hindemith’s score. For audiences unaccustomed to reading movement in a structured way, the virtuosic parts of these ballets are the most appealing: the spectacular allegro beginning of the Bizet (led by Tiler Peck and Andrew Veyette), its sinuous second movement (Sara Mearns and Jared Angle), its leaping third movement (Erica Pereira and Antonio Carmena) and its finale, where the entire cast of more than 40 dancers gradually assembles one unit at a time into a grand display of technique. I’ve always wondered if Balanchine inserted a couple of extra repeats into Bizet’s finale so that he’d have a new musical surge with which to bring in each complement of solo and ensemble dancers that will achieve the culminating spectacle. More than a demonstration of technique or design, it’s an extravagant celebration of the hierarchical scheme that underlies classical ballet itself. The Four Temperaments does attach titular human qualities to its various sections, though Hindemith and Balanchine both disavowed any literal interpretation of the parts they called Melancholic, Sanguinic, Phlegmatic and Choleric. But they both, I think, meant the music and the dance as abstractions in the modernist sense of the term: extrapolations of real concepts. Unlike Symphony in C, The Four Tempera­ments has neither elaborate costumes nor conventional floor formations to please the eye. Balanchine counted on the audience to track the development and variation of a step vocabulary that he introduced in the initial three “themes,” and if they couldn’t do it with their eyes, the music would lead them. The strangeness of this movement jars you away from its technical origins, into thinking about it as action. So the man who lurches backward and catches himself just before he falls to the floor, who steps carefully through a kind of barrier made by four women, and who retreats by reaching behind him and staggering into the wings, can project a feeling of Melancholy though he doesn’t actually act sad (Gonzalo Garcia). The man called Phlegmatic (Ask la Cour) clasps one ankle and dreamily contemplates his leg while holding it in the air and later creates a jazzy but mannered line dance with four female companions. He can seem negligent, willing to go along with anything or forget about it. I could see relationships like this throughout Four Temperaments, but for me the ballet is a supreme musical experience above all. Hindemith was a modernist with a firm grip on classical form. The choreographer not only demonstrates these musical strategies as he does in Symphony in C, but orchestrates the dance into them like an additional line in the score. From the first themes, he picks up the musical emphasis on the after-beat with a syncopated extra movement where you wouldn’t expect to see it (as if counting: one and two three four). He re-creates counterpoints found in the music and sometimes brings them up again where the music omits them. In the Phlegmatic section, the four ensemble women step from quick canons into unison around the solo dancer. Seeing all this, and more, makes me hear the music better. This is one ballet I never tire of although I’ve seen it many times. Peter Martins’ Symphonic Dances on the same program could serve as a kind of bridge between Balanchinian classicism and Robbins’ return to the romantic. Curiously, though the ballet had a big score by Rachmaninoff and huge, sweeping, clashing groups of dancers led by Teresa Reichlen and Zachary Catazaro, I have few memories of it. Distinct borrowed images flashed by at times: the rejected princesses in Swan Lake, the hero making his way through a group of fateful women in Baiser de la Fée. But they didn’t seem to add up to anything. In all these years since his first—-and perhaps only—-strange ballet, Calcium Light Night (1977), I’ve never really understood how Martins’ choreography can be so formally scrupulous yet emotionally disinfected. Martins hasn’t had an easy job as ballet master in chief (aka artistic director) succeeding Balanchine and Robbins. In addition to maintaining NYCB’s status at the forefront of American ballet companies, preserving the Balanchine style and repertory, and making his own ballets, he has undertaken something Balanchine and Lincoln Kirstein didn’t seriously attempt: nurturing new choreographic talents. He’s given encouragement and exposure to Christopher Wheeldon, Alexei Ratmansky, Justin Peck, and other aspirants. Spinoff groups headed by NYCB principals Ashley Bouder and Daniel Ulbricht were active last summer giving off-the-reservation exposure to rising choreographers and dancers on summer break. Ulbricht’s program at Jacob’s Pillow began with Jerome Robbins’ In the Night (1970), a continuation of the tremendously successful Dances at a Gathering from 1969. Both ballets originated in the New York City Ballet after Robbins returned from years of making musical hits and experimental theater. They were both set to Chopin piano music. In the Night, less free-form than Dances, has three couples in succession, each with their own relationship and affect based on the changing moods of four Nocturnes. Robbins admired Balanchine extravagantly, but he didn’t explore Balanchine’s formal strategies until later in his life. His more perceptibly human approach attracted an audience that hadn’t been drawn to the NYCB and provided a much-appreciated alternative to Balanchinian classicism for the regulars. At Jacob’s Pillow, Sterling Hyltin and Tyler Angle danced the first duet of In the Night, to Chopin’s slow, meditative Opus 27 No. 1, with big, airy movements and stretched lifts. The second duet (Teresa Reichlen and Amar Ramasar) began with haughty attitudes reminiscent of a Russian czardas, then escalated into increasingly passionate acrobatics. The third couple (Rebecca Krohn and Jared Angle) were troubled and tempestuous, like the music, Opus 55 No. 2. She was temperamental, he was patient. He’d nuzzle her from behind her back, and she’d turn her head away. She’d withdraw from his outstretched hand. Finally, she stood in front of him and cradled his face in her hand, then lightly pressed one hand after the other down the front of his body, until she was kneeling at his feet. Forgiving, he drew her up into an embrace and carried her off. The couples assembled briefly for one last dance, remaining absorbed in their partners until a final sequence of polite bows and a moment of stillness, possibly imagining whether they might change partners. Then, reunited, the couples strolled off in different directions. Despite the tricky lifts and occasional tacky “feminine” affectations, Robbins stuck to the classical language, and to dancing. The four short pieces that completed Ulbricht’s program, two by Justin Peck, one by former Royal Danish Ballet star Johan Kobborg, and one by Christopher Wheeldon, all seemed to be testing the durability of dancing at a moment when tricked-out athleticism stands for choreography and erotics takes the place of feeling. The program touched off a train of thought about dancing partnerships and competitiveness. Justin Peck, still in the second rank of New York City Ballet but recently named as Resident Choreographer, has embarked on an auspicious dancemaking career. Besides receiving opportunities to add to the NYCB repertory, he’s worked for several other companies. His Distractions (2011) pitted four men of the ensemble, Ulbricht, Ramasar, Russell Janzen and Jeffrey Cirio, in a comradely combat of feats. Wheeldon’s already well-known After the Rain (2005) shuttered down on a couple (Rebecca Krohn and Tyler Angle) in the throes of an extroverted love scene. Peck’s Sea Change (2013), I thought, could have been a sequel to In the Night. To Franz Schubert’s Sonata No. 20 in A Major, two couples (Sara Adams and Russell Janzen, Sterling Hyltin and Jared Angle) are dancing in an imaginary ballroom or perhaps a drawing room. They’re dramatically aware of one another and gradually exchange partners. As the dance ends, one pair is on the sidelines, watching the other. The closer, Les Lutins (The Goblins) from 2009 by Johan Kobborg, had Ulbricht and Cirio, two small but dynamic classicists, in friendly competition until the arrival of Shelby Elsbree. Neither one of them wins her, however; it’s the music and the musicians, pianist Craig Baldwin and violinist Kurt Nikkanen, who magnetize her. The struggle was marked by the meticulous jumps, turns, and scamperings of all three dancers, plus some jokey rivalry business that could have come out of Bournonville. Throughout the program, the musicians—and the piano—advanced ballet by ballet from the wings onto the stage, until they were literally sharing the action with the dancers. Conveyed literally by Kobborg’s ballet and conceptually by everything on the program, not to mention Bournonville and Balanchine, music was a major attraction in the game.